January 10th in Wordpress Plugins by Wordpress Jedi . Every WordPress webmaster understands the importance of properly tagging their posts and pages. Linking to existing tags in your new articles is a great way to help your visitors find more interesting content on your site. Already Existing Tags for WordPress can help with that. It finds tags in your posts and automatically assigns them. 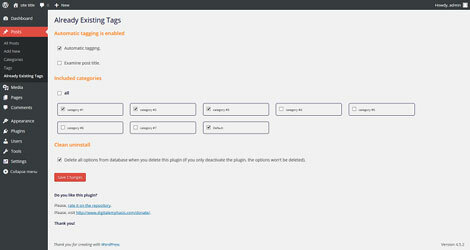 The plugin lets you choose whether post title or all categories should be examined. Every time you create a new post, this plugin goes to work as long as you have Automatic tagging checked. A clean uninstall option is also available. This is a free plugin.